A REFUGEE is defined as; “A person who has been forced to leave their country in order to escape war, persecution, or natural disaster.” For this particular picture, it is to escape a war. DR Congo (DRC) is synonymous with war. It is possibly the country with the most internal conflicts in the world. I took this photo in a transit refugee camp in a border town of Kisoro, some 500km west of Kampala, Uganda’s capital. She was one of several thousands of Congolese who were fleeing in Uganda when the ongoing conflict between the M23 rebels and the DR Congo government intensified in the eastern part of the DRC. Over 800,000 have since fled their homes since the rebellion started. 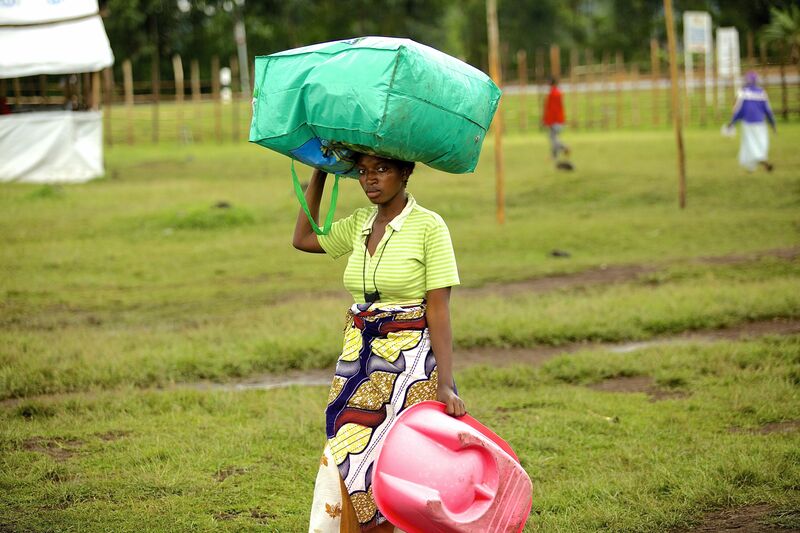 It’s quite a distance between her hometown and Kisoro, as such; I would imagine she would have preferred to carry her entire house with her but one head and two hands could not. I can see with her is money pass hanging around her neck, her baby’s basin and possibly clothes, saucepans and a few other necessities on her head. Amidst these challenges, she wears a very strong candid face. One that has accepted the challenging environments she’s surrounded with. An environment of a homeless woman. As always, your shot kind of draws me into the moment; evokes an emotion. Reblogged this on All Eyes On.